You’re late for the council of Ravendell meeting and the door has closed. To the left of the courtyard you’ll see a plant spot in a gap in the wall, switch your character to Sam and press the A button on the plant spot to grow a plant with large flowers. Jump over the river using the flowers as bouncy stepping stones by pressing and holding the B button. On the other side of the river you’ll see a dig spot, press the A button and rotate around the directional buttons to dig and reveal krank handle. Jump back over the river and head to the far top left of the courtyard where you’ll see a box with cogs. Standing infront of the box press the A button to place the handle on the krank and press the A button again to krank the handle. To the far right of the courtyard you’ll see a gold climbing handle, jump up to hang off the handle and jump again to jump up to the platform above. To the right you’ll see another krank handle press the A button to pick it up and head back to the door where there is another box with cogs. Place the krank handle on the krank again and press the A button again to krank the handle and open the door. Ravendell Character Profiles, Part 1 – Before making your way through to door, head to the bottom of the screen where you’ll see a fountain with two status to the left and right. Push the status towards the fountain to turn it on and reveal the Ravendell Character Profiles, Part 1. Now head through the door to activate a long cut scene. You’ll reenter the courtyard where Bilbo is waiting for you, head to the front of the fountain and press the A button while standing infront of Bilbo to activate a short cut scene. Note: You can head to the south of the courtyard and down the narrow path to collect a load of studs. Head to the right of the fountain and continue through the circle of light to next area. Head back over the bridge and over the bridge to the left. Continue through the circle of light. Head down the path until you get to a white tent, if you stand infront of the white tent and press the A button you can browse items available to buy in the shop. You now need to make a decision whether to go to the village of Bree (circle of light to far right) or go to the Pass of Caradhras (circle of light to left of the white tent); I chose to go to the Pass of Caradhras which finished the level. 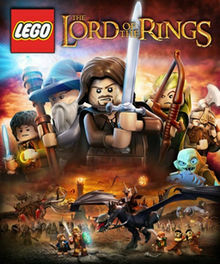 This entry was posted in DS and 3DS, Games, LEGO Lord of the Rings on February 24, 2013 by Tasha.